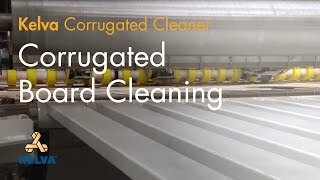 Kelva’s highly effective Corrugated board cleaner with it’s guaranteed non-contact cleaning principle, combines full speed production with full width cleaning on both sides. Automatic height adjustment and a self cleaning filter guarantuee continuous production with measurable decrease of shingling and environmental dust, lessening need for washing cycles and resulting in a much better product, ready to be printed! Kelva offers PLC controlled non-contact cleaners with automatic filters for the corrugation machine. Or single sided non-contact cleaners for the flexo press.